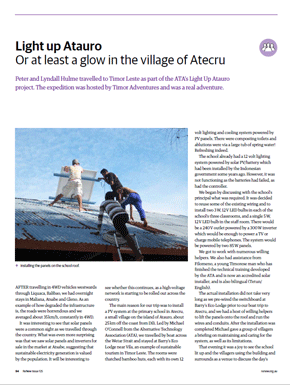 Light up Atecru on Atauro Island: Monday 30th September – Tuesday 8th October 2019. We installed solar household lighting systems to light-up 64 households in Maluro (A village) in the sub district of Quelicai in the district of Baucau. .
We installed a solar system to the maternity clinic that is being run by the nursing sisters of the sisters of Mercy in Maucatar, a village in Covalima District. 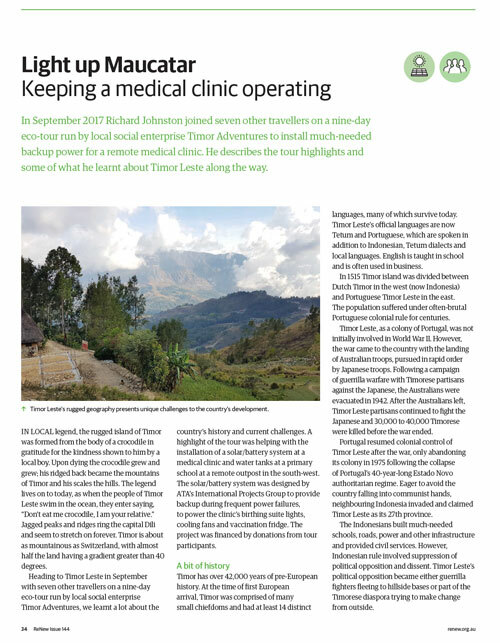 Power to the clinic was inconsistent and causing issues for medication that needed 24hr refrigeration. In addition we were asked to install guttering on a school…how could we say no, it was worthwhile and fun. It was an amazing trip, just look at the reviews on TripAdvisor. Timor Leste is only one hour by plane from Darwin. It has been a new nation since 2002 and is busy building everything from a police force to an education system. Much progress has been made with help from many countries including Australia but there is still a long way to go. For many years now the Renew has been working in Timor Leste to provide solar power installations in community facilities and remote villages. 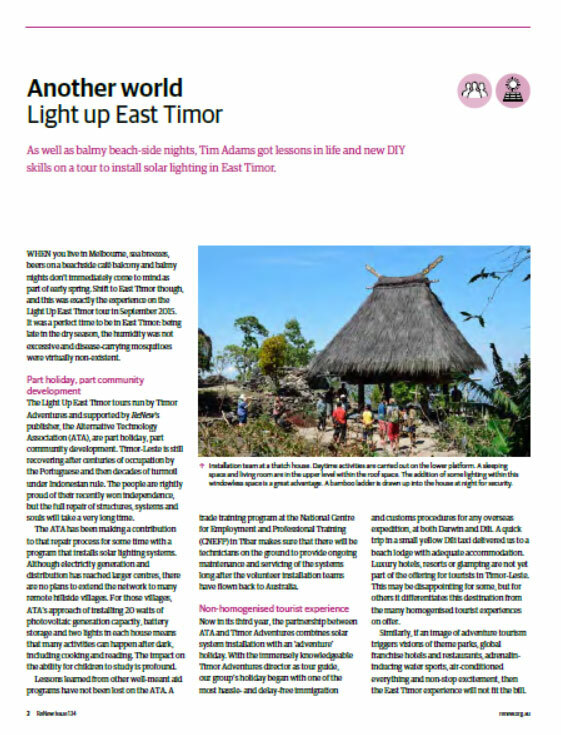 In 2013 Renew partnered with Timor Adventures to offer the Light up Timor Leste tours. The tours went really well, we have been running them ever since. Light up a school with 3 classrooms and a teachers office We would be able to install three LED lamps in each classroom and a single 12 VDC as well as a 5W LED lamp in the staff room. The staff room would also housed a 300W inverter to provide AC power. All powered by 170W (2 x 85 W) solar PV panels, 200 Ah of 12 V batteries and a PL-20 20 A regulator. All up the system would provide lighting in three classrooms and the staff room, together with the provision of AC power in the staff room for a laptop, printer and phone chargers. Light up to 20 homes in a villages specifically installing the Renew designed Village Lighting System (VLS). The VLS is a 30W solar power system that provides for three lights and a phone changer for a home. Power is stored in a 20Ah battery. The system provides between two and five hours per night of light depending on usage and weather conditions. To build on the training already conducted by Renew over the past 10 years and to build technical capacity in-country, in December 2013 Renew signed an MOU with CNEFP Tibar (an East Timorese training institution) to establish an ongoing technical support role. The CNEFP Tibar solar team will perform the installation of new systems as well as assist with the ongoing maintenance of systems. Renew will support the services of the CNEFP Solar Team by providing funding for services and mentoring of staff. For more information about the tours contact us or for more information about the work of Renew in Timor Leste have a look at the International Programs group website.